Artificial grass is a great solution for both residential and commercial properties because it can help save a good deal of money mostly spent on maintenance. Although it may require quite an amount for the initial investment, the savings it brings in the long run is worth it. It does indeed require very minimal care but it still has to be maintained well to keep it in clean and pristine condition, not only to make it look good all the time but to also optimize its life expectancy. Here are some great tips on how to care for a synthetic lawn. After installation, contractors may not totally clean the area up. Although you don’t need a complete set of garden tools to clean it, you might want to at least have a hose, a leaf blower, and a rake. These are great for removing fallen leaves, if you have a tree nearby, which could rot on top of the fake grass if left there to dry. You may even use a vacuum cleaner to remove dirt and dust that may accumulate in time. This is especially important if you let kids play on the artificial grass. This can be done with a rake or a stiff brush. 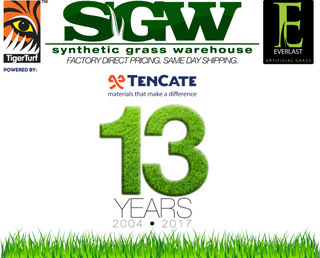 This synthetic grass may start to bend as time passes by, especially if foot traffic on it is quite heavy. To keep it looking up and alive again, just run to brush through it until the blades align in an upright position. You don’t have to do this on the whole area, just the areas where the blades seem to be bent. If your kids use the synthetic lawn frequently, cleaning it with a mild detergent and water will help keep it clean from dirt and dust. If anything spills on it accidentally, a wash using mineral spirits will be quite handy. Just make sure to clean it up immediately before it dries and stains the grass permanently. Washing and rinsing will also help remove any unpleasant odors. An artificial lawn can get quite hot especially during very warm climate. If you plan on walking barefoot on it, it is highly recommended to hose some water onto it to cool it down first. It is important to keep in mind, however, that the heat of the sun will not damage the artificial grass blades at all. Artificial grass is all the rave nowadays for both residential and commercial areas. Why not? It is a great solution to the water problems that San Diegans are currently facing. Also, it provides the consistent aesthetic appeal that any property owner is aiming for. But not only those with wide backyards and lawns have the privilege of enjoying the best artificial grass features. Even small spaces can have it installed, and for much better reasons. It is definitely a challenge to plan and install water lines for a faucet or sprinklers in a very small backyard. This does not mean that you can forget about ever getting grass on your outdoor space forever. Installing artificial grass can give you the same benefits of having an outdoor area to play at and enjoy without having to worry about water lines or water itself. Because it does not grow, your small backyard would never look like a small overgrown field if left unattended. Therefore, you won’t have to wake up one day and find that your backyard looks a lot smaller because it is crowded with overgrown grass. Also, you won’t ever have to deal with unwanted weed growing along with it. More often than not very small backyards can not maximize sunlight especially if it is built in a shaded area of a property. If you had real grass, you would probably be looking at yellow and dry, brown grass every single day. But because artificial grass installation does not ever require sunlight, then you’re all good. You may think that a small backyard gives you limited options when it comes to design. 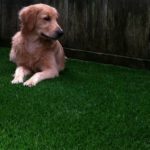 Whether you are installing artificial grass for dogs, kids, or for your own enjoyment, it can still look absolutely stunning all year round if you use fake grass. One thing that this option ideal is the low cost of artificial grass. 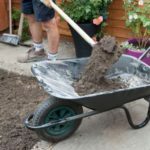 If you are living in a small property with a very small lawn or backyard, it can easily be done by a professional installer even if there is no soil available. You can consult a pro who knows how to install artificial grass as to how it could be done so you can get a better understanding. Artificial Turf Installation: How Much Does it Cost? 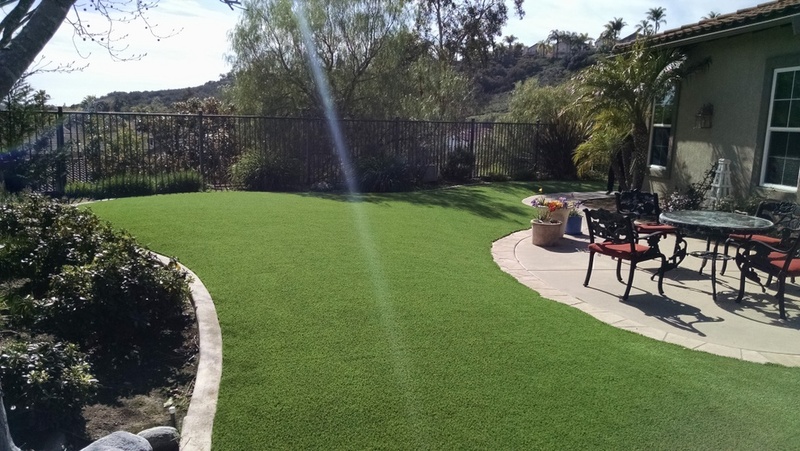 Artificial grass is slowly gaining popularity due to a lot of good reasons. 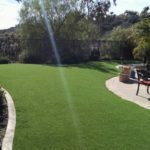 For those who are starting to take interest in having a synthetic turf installed in their backyard, cost is one of the most important factor that needs to be clarified first. This is totally understandable. Home improvement always comes with a price and homeowners must make sure that every penny goes to a sound investment. 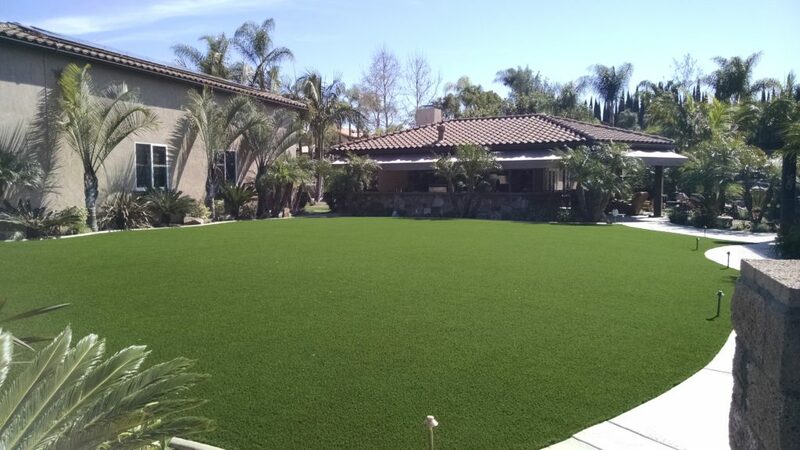 The price of installing artificial grass depends on a lot of factors. This is the reason why it is highly recommended to get a quote from a reliable contractor first before actually hiring one and making the project happen. Location – Cost can be affected by where you are located. It would depend if your residence is quite far and difficult to reach. It also depends on the geographic location as some states have higher price ranges than others. Materials – There are quite a selection when it comes to fake grass, there is quite a selection of thickness, quality, type, and more. It might also depend on whether you are installing artificial grass for dogs, for a putting green, or for any specific purpose. The more expensive ones are often the most durable and realistic. It will also depend if the materials need to be imported from some place else. Labor – When it comes to labor, the amount of work involved could influence the cost of installing your turf. Will they have to install on an existing lawn, plain soil, or concrete? Will extra soil need to be removed and dumped? Will the existing surface require compacting or leveling? Size/Area – The size of the artificial lawn required will also be influential on the total price. Often, artificial grass installers compute costs per square foot. 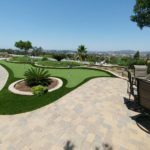 The average cost for the installation of synthetic grass in the Southern California area is around $9 to $12 per square foot. This could go higher depending on the factors discussed earlier. You might want to be cautious about companies that offer something lower than that if you want to make sure that your contractor really knows how to install artificial grass and that it is completed efficiently and on time.Make sure that you ask for a quote first after they have assessed the space to be installed on. Check their license, a valid certification, experience, and any projects they have handled recently so you can get an idea of the quality of their work. Being the most popular pastime in the US, golf is something that requires a good amount of practice to make sure you play it right. Gone are the days when you had to be a country club member just to gain access to the finest putting greens. Now, even the busiest of people can improve their game. All thanks to synthetic putting greens. If you are interested in buying one, here are some of the best portable golf putting green kits that are getting good feedback this year. Big Moss is one of the companies that specialize in portable putting greens for both indoor and outdoor use. They have a variety of products to choose from, depending on your level of expertise. One such product is the 4 ft. x 12 ft. Big Moss Augusta. StarPro manufactures one of the most realistic artificial putting green kits for interior and exterior use. This specific product measures 10 ft. x 3 ft. This 3 feet by 9 feet putting green carpet is kidney-shaped, thus, making it quite a challenging indoor practice putting green for amateurs and pros alike. It also comes with three putting holes. Does not replicate grass, thus, stimp could not really be measured. This indoor or backyard putting green kit allows you to practice uphill golfing and improve your stance and swings. Structure is not favorable for left-handed golfers as the ball return path is situated at the right side of the putting green. 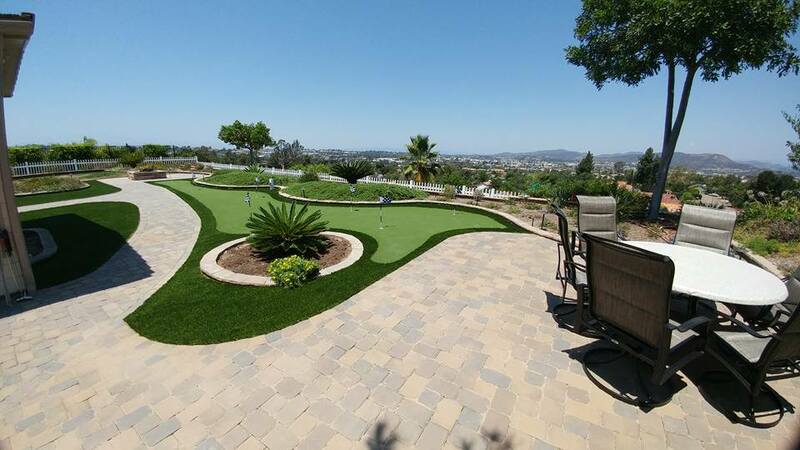 While portability is a significant factor for people who wish to have somewhere they could practice their golfing skills, it would be more beneficial to have artificial grass installed in a backyard or office space instead. Longevity – An installed synthetic putting green lasts longer than a store-bought kit. Customizable – Installing a synthetic turf allows you to customize the course, the number of holes, and any slopes you want to include for your practice. Aesthetics – Because it is properly installed using natural-looking grass, it adds more beauty to your practice area. Also, it makes you look more serious about improving your posture and game.